I have a Gravity Form set up and working on a Wordpress Installation. This form includes a MULTI-CHOICE field with options that correspond to a MULTI-CHOICE CUSTOM FIELD on Campaign Monitor with choices and segments matching the options of the Gravity Forms Multi-Choice field. Are you talking about Checkbox Fields or Multiple Choice Fields? Because a Multiple Choice Field is a Radio Button field and is a single value field not a multiple value field. Checkboxes, however are multiple values. Gravity Forms displays them individually. Make sure you are trying to match up the right type of field between GF and Campaign Monitor because a Multiple Choice field doesn't have multiple values, it's actually a single selection (from multiple choices). Hello Carl - Thank you for your reply. In Campaign Manager, I've set up a corresponding 'custom field' with options that match the options of the checkboxes in GF. However, when trying to map the fields, GF is correctly showing all the options ready for mapping, but in the Campaign Manager field list, only the parent custom field is showing, not the options. I contacted CM and they referred me to you. It sounds like a mix match in how we have these implemented. They want the checkboxes passed as an array most likely and we are trying to do them individually. We'll take a look at it and see about adding an option for the entire checkbox group. We've done similar things in other Add-Ons where we ran into the same issue. It's going to take a little bit of time to look into it and see what we need to change as it will also require an updated release of the Add-On. Hello Carl - Thank you for your update and I appreciate you looking into this! In the interim, I'm thinking to leave as is, without the mapping of the field in question, the other fields seem to be working OK.
GF is collecting the correct info which, I assume, I'll be able to update in CM manually. Unless you have any other / better workarounds that will integrate with however this gets resolved in future updates (without loosing any data). Many thanks again for your most prompt response. Carl - I see there has been an upgrade but it hasn't included / resolved this issue. Any Update / new please? I have run into the same issue as univiz and was just wondering if there had been any progress on sending across the full array of options to Campaign Monitor? Just want to note that I also need a fix for this too. Thanks. We will be releasing an update to the Campaign Monitor Add-On soon that will resolve this. How soon? I am running into a similar issue when using Checkboxes in GF and trying to map them to CM. I just talked to our lead developer and he is going to take a look at it this afternoon. We'll try to get an update released today or tomorrow. We have released an update to the Campaign Monitor Add-On that corrects the checkbox integration. Now you can map a Campaign Monitor Checkbox Field to your Gravity Forms Checkbox field. Just be sure to map it to the main Checkbox field on your form. 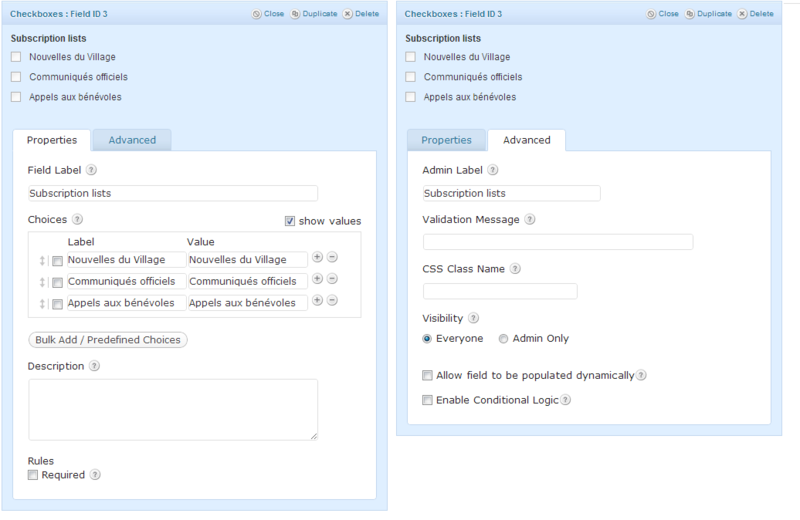 Checkboxes will appear as the name of the group as well as the individual checkbox fields themselves. So be sure to pick the main group by it's Field Label. Also, you need to use the [square brackets] in the field checkboxes in order for the values to be received by campaign monitor in the custom fields. I had this issue but managed to make it work. I'm trying to sync it to "Name of the group" which is the name of my checkbox list on CM. If I sync the two and save the box remains blank. I wanted to try what mmtrav suggested but I have no idea where he means for me to add the square brackets, does he mean the admin label for the group or each individual checkbox? Any documentation on how this works? does he mean the admin label for the group or each individual checkbox? I believe that's what he means. Did you try it already? I'm not sure where that information came from, but it seems useful to have if it is necessary to sync the fields. Do you see anything blatantly wrong? I wonder if accented characters have anything to do with it? Can you try with simpler names, just as a test, to see if something is getting lost in translation with the accented characters? I changed the lists to have no special characters and I was able to link them so I'm guessing GF doesn't use the same encoding as CM. Would it be possible to have this fixed? Actually I think it was the single quote that was breaking it. 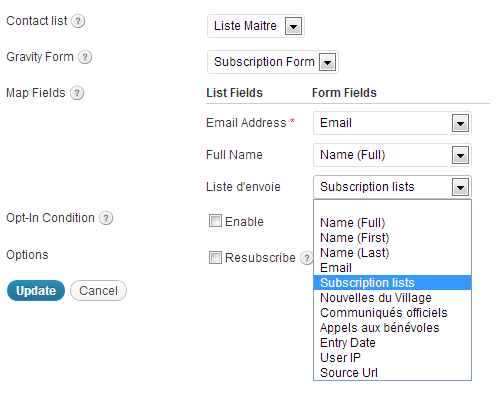 My custom field was called "liste d'envoie" and it wouldn't sync but once I changed it to "subscription list" it worked. Sounds like it's working for you now? I'll bring this topic to the attention of the developers to see if there is anything we can do. @impeka, I have an updated version of the Campaign Monitor add-on if you would like to install it and give it a try with your original field name with the single quote. Please email me at chris@rocketgenius.com if you would like me to send you the new version. Please include a link to this topic so I know what we're talking about. Thank you.